Last year, I was a guest on an NPR call-in talk show to discuss workplace etiquette. Most calls were about shaking hands, conducting meetings, asking for a raise, recovering from calling your boss by your wife's name (maybe that's just me). It was light and funny, until one caller asked for advice about being shunned by her coworkers. They would gather near her desk, talking about work she was involved in without asking her to weigh in. They never invited her to lunch or after-work drinks. When she brought up her feelings, her colleagues dismissed and mocked her. She felt unimportant and ostracized. And she sounded deeply distressed. I felt ill-equipped to answer the question. I stammered out a reply. I made a joke (she didn't laugh). The show's host suggested that she record these instances and, if they continued, alert a supervisor. The host labeled the behavior as “bullying.” Which at first struck me as infantilizing. I hadn't felt bullied since middle school. Or had I? The major problem with the word bullying is that it seems more tied to the playground and, these days, social media (which is a metaphorical playground). Walking up to a coworker and flicking an earlobe? I think we'd all say that's bullying. (It is also assault – amusing assault, but still.) But what about rolling your eyes every time a colleague speaks in a meeting? Gossiping? Raising your voice? The things we've all been guilty of doing? The question for most of us isn't: are we being bullied? It's: are we the bullies? Are we engaging in behavior, even occasionally, that…well, what? That hurts a colleague's feelings? That threatens them? That gives them an ulcer? The effects can be serious. Studies have linked rude behavior to decreased performance. In one joint study by the University of Southern California and the University of Florida, after a researcher belittled participants, they scored 33 percent worse on puzzles and came up with 39 percent fewer brainstorm ideas. Even people who simply witnessed uncivil behavior performed 22 percent worse on puzzles and had 28 percent fewer ideas. So what constitutes bullying? 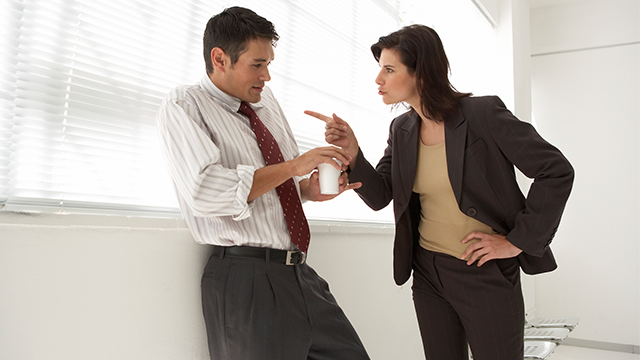 “Bullying can include angry, aggressive or hostile behavior from a colleague or a supervisor,” says David Ballard, assistant executive director for organizational excellence at the American Psychological Association. “But it can also be more subtle, such as secretly sabotaging someone's work, or setting them up for failure by purposely making unreasonable demands.” In short: repeated, deliberate harm. A company's success depends upon people trying to beat each other as much as trying to cooperate with each other. Competition in the workplace is a given. And so are competitive behaviors. But we can do our work without making other people miserable, if we understand how our behaviors are being perceived. Do you think that anyone you work with might go home and weep because of your behavior? Do you think that anyone you work with might see a doctor about a condition caused by your behavior? Did you skip over this column because you're obviously not a bully? It's okay to regress a little. It's okay to think about, say, middle school, and about how you felt when you were bullied, and how other children seemed to feel when they were. In bullying, as in so many other workplace behavior issues, self-awareness is the first step: getting out of your own head enough that you can see what you look like to others. When we watch ourselves, we can catch those behaviors, even the seemingly harmless ones that make us jerks. The sighs? Never sigh at work – you'll seem either tired, bored or in respiratory distress. The eye-rolling? When you feel one coming on, tilt your head down – the eye roll becomes a brief yet sweeping examination of your surroundings. The thing where you keep typing while someone is trying to talk to you in your office? I happen to be doing that at this very moment, and it's going to stop right now!